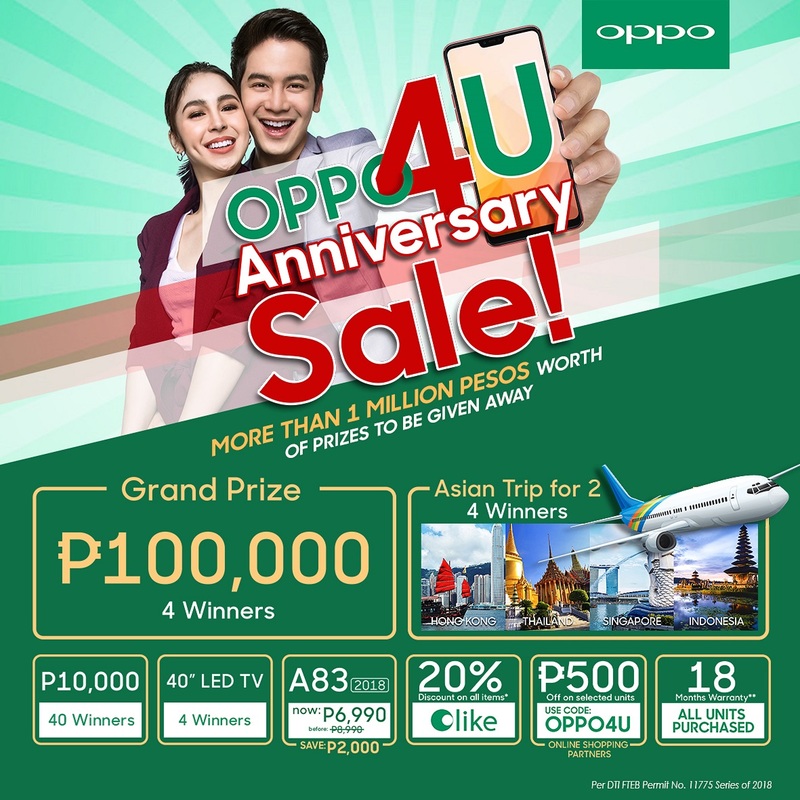 MANILA, July 3, 2018 – OPPO, the No.2 global smartphone brand in Philippines, will be celebrating its 4th year in the country in a big way this July, with the #OPPO4U Anniversary Sale. Customers participating in the sale will be eligible to win over PHP 1 million worth of prizes, get to avail of exclusive discounts, and take home a variety of freebies within the month. 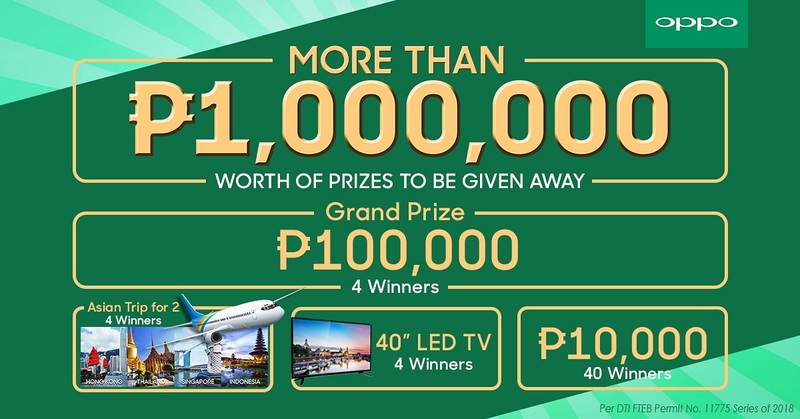 Customers who purchase any OPPO smartphone from July 1-31, 2018 will be entitled to join the raffle to win the following prizes: four grand prize winners of PHP 100,000 cash, four winners of an Asian trip for 2, four winners of a 40” LED TV, and 40 winners of PHP 10,000 cash. Consumer must visit the OPPO Philippines Facebook Page and click the OPPO4You Anniversary Sale tab. 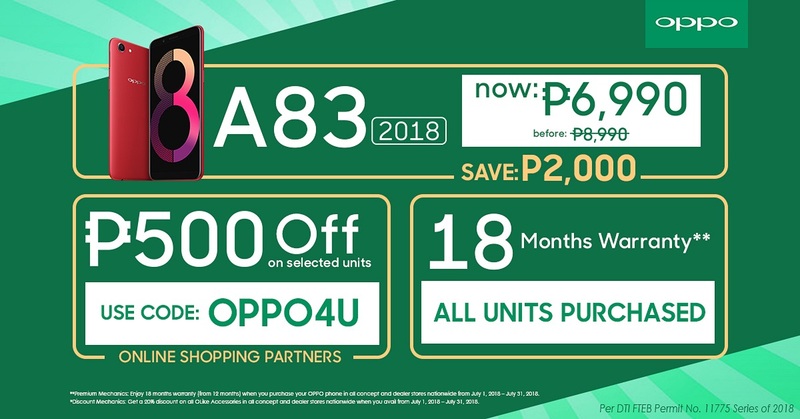 Providing #SelfieExpert experience for all, the OPPO A83 2018 2GB/16GB is now available for only PHP 6,990, saving customers PHP 2,000 and offering face unlock technology, AI selfie and full screen experience at a very affordable price point. Aside from being a #SelfieExpert, customers get to enjoy premium benefits with an additional 6- month extended warranty, providing a total of 18 months of guaranteed service. Plus, they can enhance their OPPO smartphone experience with 20% discount on all Olike accessories. Customers can avail additional online and get PHP 500 discount at OPPO Partner Stores in Lazada & Shopee by simply using the promo code “OPPO4U”. Promo runs from July 1, 2018 to July 31, 2018, per DTI Permit number 11775 series of 2018. For more information on #OPPO4U and OPPO’s official online store on Shopee, visit https://shopee.ph/oppophilippines. Customers may download the Shopee app for FREE via App Store or Google Play, and also follow OPPO at www.facebook.com/OPPOPH and Shopee at https://www.facebook.com/www.Shopee.ph/ for more updates.